Sydney, April 9: An Australian teenager lauded worldwide for egging a far-right senator who made offensive comments about the Christchurch mosque attacks was let off with a police caution for the incident Tuesday. William Connolly, now better known as "Egg Boy", cracked an egg on the head of Fraser Anning during a March 16 press conference, prompting the senator to hit him several times in the face. The controversial politician had a day earlier drawn international condemnation when he blamed the attacks in New Zealand that killed 50 people at two mosques last month on immigration. 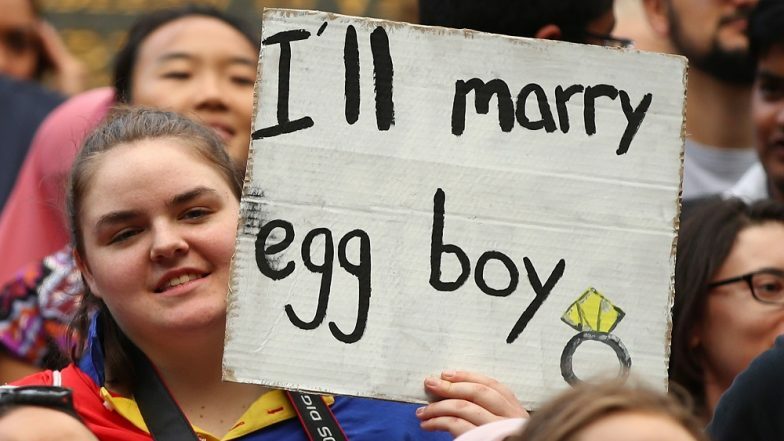 Connolly's act spawned viral memes and drew support from around the world, with a GoFundMe page raising more than Aus$80,000 (US$57,000) to help with any legal fees and "more eggs". Australian Senator Fraser Anning Egged by Young Boy For Blaming Muslims For Terror Attack on Christchurch Mosque in New Zealand, Watch Video. The 17-year-old said he would donate money raised to the victims of the attacks. Victoria state police said after investigating footage of the incident they would not be pressing charges against Connolly. "The 17-year-old Hampton boy has been issued with an official caution in relation to the incident," police said in a statement. They said Anning had also escaped charges. "On assessment of all the circumstances, the 69-year-old's actions were treated as self-defence and there was no reasonable prospect of conviction," police said. Several men could be seen pinning Connolly to the ground after the egging. Police said they had charged a 20-year-old man with assault following the incident. Anning, who was elected in 2017 by a fluke of Australia's proportional voting system, has refused to apologise for his remarks and was last week censured for his "ugly and divisive" comments by his parliamentary peers.